Simple, yet elegant. Regarded as one of our most comfortable designs due to its softly padded backrest with added support for the lower back, the Seat craft Millennia recliner chair is a must-have addition to your living room. The finest, hand-picked top grain leather, chosen for its premium look, texture, and durability. Armrest includes stainless steel cup holders. 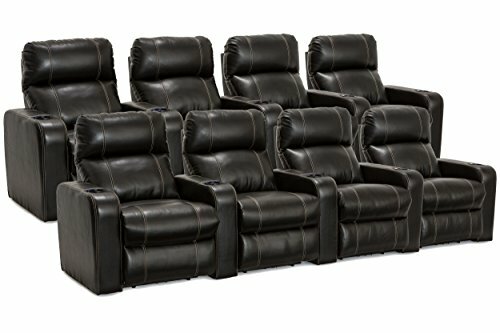 The Dynasty home theater seating from Lane offers enveloping comfort within a warmly inviting seat design. 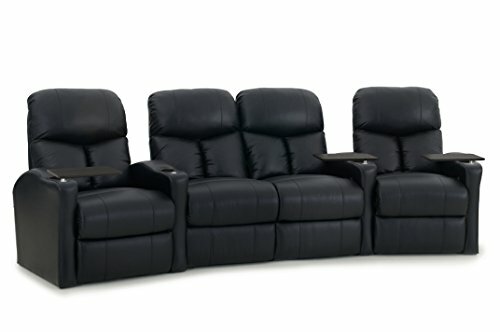 The Lane Dynasty is fashioned from black bonded leather, a material designed to match the luxury appearance and soft texture of top-grain leather, while its black color is sure to match any home theater decor setup. The seat backs of the Lane Dynasty feature a delightful contrast stitching pattern that runs vertically down the back, seat, and footrest, for a cozy ambience. Lighted cup holders keep beverages secure and within arm's reach as well as easy to locate in a darkened room. 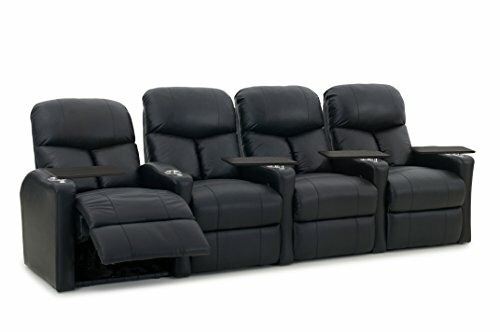 Meanwhile, power recline lets you adjust to any desired position at the press of a button, maximizing convenience. 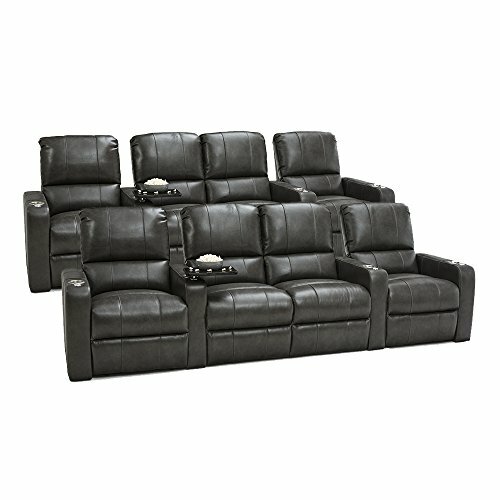 Lane Dynasty home theater seating will allow anyone to sit back in distinct lounge ambience for every occasion. 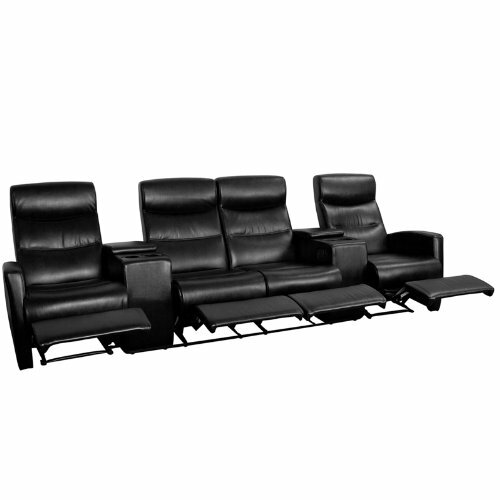 The Octane Bolt XS400, shown here as a row of 4 seats straight with middle loveseat in black bonded leather and manual recline, offers a space saving design along with incredible lower lumbar support. 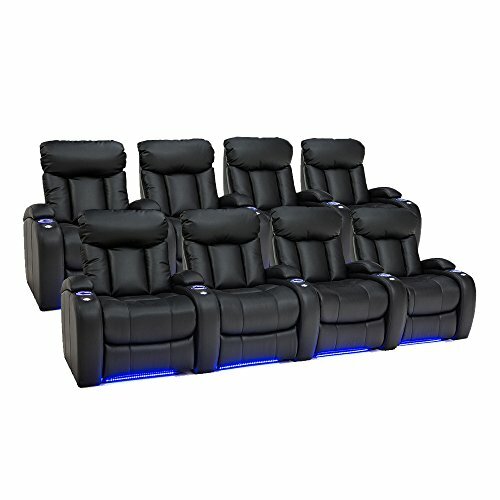 The Bolt offers incredible comfort and comes equipped with black aluminum cup holders and offers many optional accessories for the ultimate home theater seating experience. The Bolt also offers a premium layer of gel infused memory foam in the seat cushion for unparalleled comfort - the only theater seating brand with this feature! The seat back on the Bolt theater seat has an ergonomic design that will fit the contour of your spine and lumbar region. The Accessory Dock, included on this model, fits a host of accessories that can be purchased separately (not included) which include a swivel tray table, wine glass holder, LED flex reading light, an iPad and phone holder, and other accessories that continue to be designed. The Bolt shown here is upholstered in a thick and supple bonded leather. It is extremely durable, easy to clean and excellent for families with pets and children. The Seat craft Orleans seats highlight a three-section back with overstuffed headrests, with full bucket seating for premium lower body relaxation. The wall-hugger seating feature allows you to fully recline while sitting mere inches from the wall. Finally, ambient base and cup holder lighting allow you and your guests to enjoy a discreet azure glow that will allow freedom of movement in the dark. With the Orleans construction and features, all of your recliner chair requirements will be met and turned into everyone's favorite chair in the house. The Octane Bolt XS400, shown here as a row of 4 seats straight in black bonded leather and manual recline, offers a space saving design along with incredible lower lumbar support. 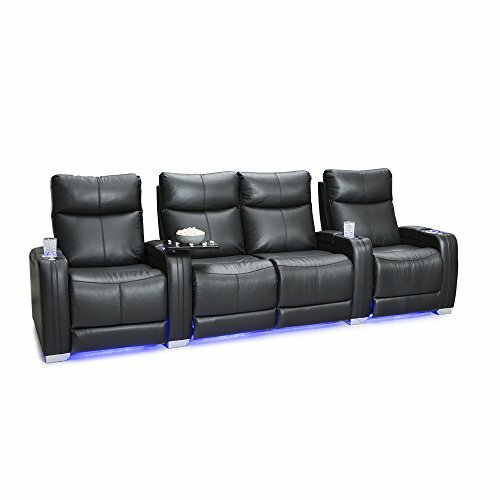 The Bolt offers incredible comfort and comes equipped with black aluminum steel cup holders and offers many optional accessories for the ultimate home theater seating experience. The Bolt also offers a premium layer of gel infused memory foam in the seat cushion for unparalleled comfort - the only theater seating brand with this feature! The seat back on the Bolt theater seat has an ergonomic design that will fit the contour of your spine and lumbar region. The Accessory Dock, included on this model, fits a host of accessories that can be purchased separately (not included) which include a swivel tray table, wine glass holder, LED flex reading light, an iPad and phone holder, and other accessories that continue to be designed. The Bolt shown here is upholstered in a thick and supple bonded leather. It is extremely durable, easy to clean and excellent for families with pets and children. 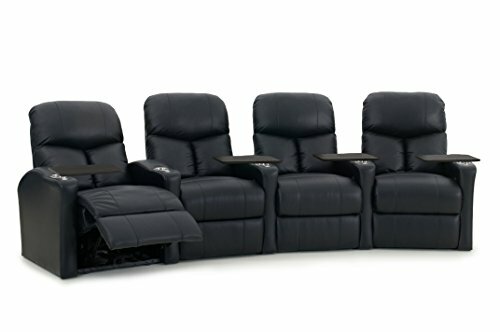 The Octane Bolt XS400, shown here as a row of 4 seats curved with middle loveseat in black bonded leather and manual recline, offers a space saving design along with incredible lower lumbar support. 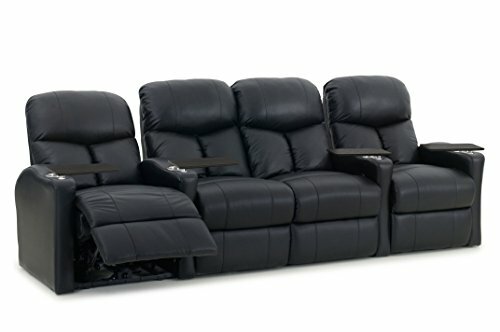 The Bolt offers incredible comfort and comes equipped with black aluminum cup holders and offers many optional accessories for the ultimate home theater seating experience. The Bolt also offers a premium layer of gel infused memory foam in the seat cushion for unparalleled comfort - the only theater seating brand with this feature! The seat back on the Bolt theater seat has an ergonomic design that will fit the contour of your spine and lumbar region. The Accessory Dock, included on this model, fits a host of accessories that can be purchased separately (not included) which include a swivel tray table, wine glass holder, LED flex reading light, an iPad and phone holder, and other accessories that continue to be designed. The Bolt shown here is upholstered in a thick and supple bonded leather. 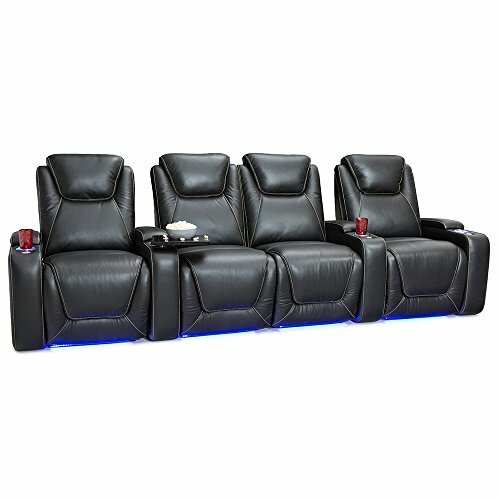 Copyright © Wholesalion.com 2019 - The Best Prices On 4 Leather Home Theater Online.